Got a headache? Here are six reflexology and acupressure points that you can massage on your hand for quick pain relief. One of the most popular articles on my website is 4 Points on Your Feet for Headaches and Migraines. While it’s been shared over 10,000 times, I have to admit that the article isn’t that helpful when you can’t massage your feet. Sometimes it’s not possible to sit down, pull off your shoes and socks, and press on those powerful reflexology points for relief from headache pain. Imagine removing your shoes in in the middle of an important meeting at work! For those times when you can’t massage the reflexology foot points for a headache or migraine, here are six powerful hand reflexology and acupressure points to give you fast relief. 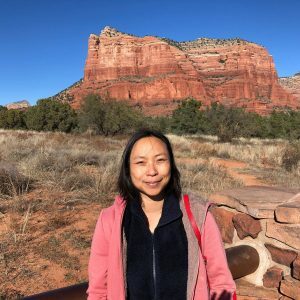 A couple of weeks ago, I was in Sedona, Arizona to attend a writer’s workshop. (Yep, working on that second book. Psst, it’s going to be about vision.) I rarely get headaches, but when I do, it’s always happens when I’m flying. I’m one of those people that gets a bit nervous and tense when I fly. I also never wear a watch. So when I’m traveling, it’s stressful for me to pay attention to schedules in order to get to a destination by a particular time. Then there’s something about the pitch of the airplane seats that is awkward and uncomfortable for me. I have short legs, which is great in terms of legroom, but it also means I never feel properly balanced in the seat. My head and neck lean back too much, and I overcompensate by holding them stiffly upright. Most of the time though, if I consciously relax, massage my reflexology points, or use a neck pillow, I’m good. But I didn’t bring a neck pillow because it was a short flight. I thought I’d be fine, but then my flight was delayed by almost three hours. After we landed, it took 45 minutes to get my rental car. By then, it was rush hour traffic in Phoenix. Instead of heading to Sedona, I decided to change my plans and stay in Phoenix for the night because I didn’t want to be driving in the middle of nowhere by myself in the dark. A last minute booking during Phoenix’s busy conference season led me to a sad little hotel next to the highway. Needless to say, I didn’t sleep very well that night. The next morning, I woke up with a crick in my neck and the two-hour drive to Sedona aggravated it. The car had very heavy steering and it took a lot of manhandling and muscling to drive through the mountainous terrain. I started to feel a slight ache in my head. By the time I reached Sedona, the ache had blossomed into a full blown headache. I did not feel like myself. I sat woodenly as I ate lunch in Whole Foods. Later I was walking around the supermarket in a haze when it suddenly occurred to me that I could rub my reflexology points. How could I have forgotten this? I surveyed where I was. Nope, not taking my shoes off in the veggie aisle. Could I massage outside? Scratch that. It was freezing cold and windy. What about the car? No! Every cell in my body wanted to avoid the cramped stuffy car with its “new car smell”, aka off-gassing. As I walked past the squash, it dawned on me that I could try rubbing points on my hand instead. I was a bit skeptical if the hand points would be as effective as the feet, but within a few minutes—somewhere near the fruit section—I noticed that I was starting to feel better. It occurred to me around the refrigerated probiotics, that I could share these hand points for headaches on my blog. If they could help me when I couldn’t massage my feet, then they could help a lot of people. So even though these points aren’t as powerful as the foot points, they do help relieve headache pain and make things feel more manageable. Thank goodness for those hand points! They made me feel like myself again after a stressful day and a half of travel. I hope they’ll be helpful for you too. Me in Sedona. No more headache. Enjoying the beautiful scenery. 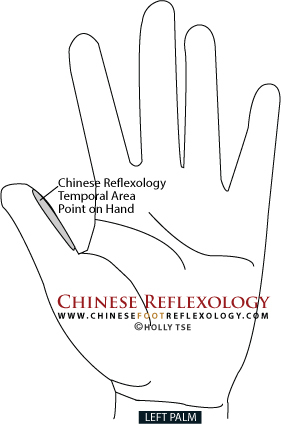 In Chinese Reflexology, points on the feet correspond to different areas of your body. The feet are a microcosm of your body, and this holds true for your hands too. The thumb represents your head. When you have a headache, you want to massage your thumb to help clear energy blocks that are causing the pain. As you read through this article, do this sequence of six points on your left hand first, and then repeat on your right hand. Feel like you got a sinus headache? 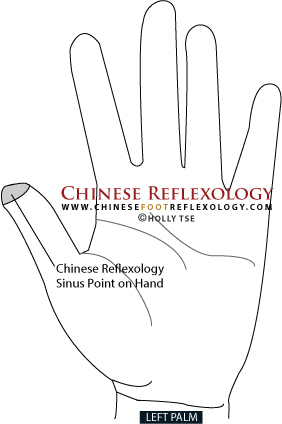 The Chinese Reflexology hand point for the sinus helps relieve the stuffy blocked feeling in your sinuses that causes pain in your forehead and cheeks. Don’t be surprised if you get a bit of a runny nose as you massage this point because it’s helping to clear your sinuses. Location: This point is located on the tip of your thumb pad on both hands. How to massage: Use your opposite thumb to massage the tip with a side-to-side motion, from the left side of the thumb to the right, and back again. Use a firm pressure like what you would use to scrub some marker off your hand, and massage for about 5 to 10 seconds. The temporal area point corresponds to the temples and trigeminal nerve, which has three branches going to the eyes, cheeks, and jaw. That’s what makes this point especially beneficial for headache and migraine pain. But, it’s very important to massage it the right way. Location: The temporal area point is located on the inside edge of the thumb. It starts beside the thumbnail—just below the bottom of the sinus point next to the tip of the thumb—and extends just below the thumb pad. But I like to massage all the way down to the base of the thumb. How to massage: Since I’m going to mention the thumb of both hands, I’ll give instructions for the temporal area on the left thumb first to minimize any confusion. Use your right thumb pad to massage the inside edge of the left thumb with a side-to-side motion (like a sawing motion perpendicular to the left thumb). Begin at the left thumbnail and continue the side-to-side massage as you gradually shift your right thumb down the inside edge of the left thumb until you reach the base of the left thumb. Consider that one stroke. When you get to the bottom of the left thumb, lift up your right thumb, place it back beside the nail of your left thumb, and repeat the stroke. Reposition your right thumb near the left thumbnail on the inside edge, and repeat the side-to-side massage until you get to the base of the thumb. Massage for a total of three strokes. Now that you’ve got energy moving through your head by massaging reflexology points on your thumb, use this acupressure point to move qi (energy) throughout your entire body. Please note that this point should not be massaged if you are pregnant because it’s an acupuncture point that is sometimes used to stimulate labor. 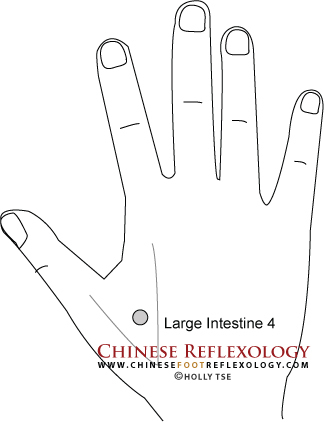 Location: You’ll find Large Intestine 4 in the webbing between the thumb and index finger. It’s located on the back of the hand (not the palm) on both hands. Press your thumb tightly against your index finger and this will cause a muscle to bulge out where the webbing is. The highest point of this bulge is where you’ll find Large Intestine 4. How to massage: Use the opposite thumb to press and hold this point for 60 seconds. A pain in the neck can lead to pain in your head. If you have a lot of tension in your neck and shoulders, this can lead to a tension headache. 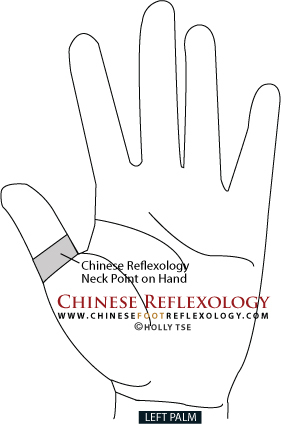 Massage the Chinese Reflexology neck point to help improve the flow of qi and blood through your neck. It’s like giving yourself a neck rub, only you’re doing it through your hand. Location: The neck reflexology area is a band located at the base of your thumb. Think of it like wearing a very thick wedding band on your thumb. How to massage: To massage the neck reflexology point on your left hand, make a peace sign with your right hand. Then bend the index and middle fingers of your right hand so that they form bunny ears. Wrap the bunny ears around the base of your left thumb (you’ll place your left thumb between the bunny ears). Then twist your right hand back and forth to massage the circumference of your thumb. For a better yet somewhat crass visual, it’s like making a rude gesture simulating the male and female anatomy. I’ll let you figure that one out! 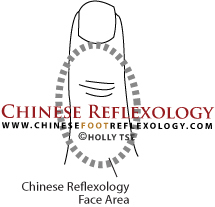 If you feel pain and pressure in your face, you’ll want to massage the Chinese Reflexology face area. While this isn’t an official reflexology point, it gets the qi and blood flowing through your face to help relieve pain and pressure in your eyes, cheeks, and sinuses. Location: This unofficial point is located on the top surface of your thumb from the base of your thumbnail to just above the neck point. How to massage: Use your opposite thumb pad to massage this area with a back-and-forth sawing motion. Once again, you’ll be “sawing” perpendicular to your thumb like you were with the temporal area point—only now you are massaging the top surface of the thumb instead of the inside edge. You’ll start by placing your right thumbpad below the left thumbnail. Then massage side to side as you gradually shift your right thumb downwards until you reach the base of your left thumb. Then lift up your right thumb and place it back at the base of the left thumbnail, and repeat the stroke. Do a total of three strokes. You may be wondering, why would you massage a reflexology point for your ear if you have a headache? In Chinese Medicine, there’s an energy meridian that zigzags around the ears. When energy is not flowing smoothly through this meridian, it can lead to headache pain and migraine, especially around the sides of the head. That’s what makes this point especially good for one-sided headaches. When you massage the inner ear point, it helps clear blocked energy around the ear and through the zigzaggy energy meridian. 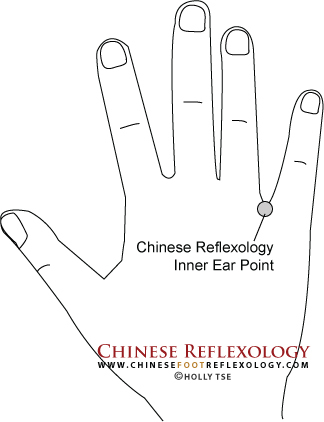 Location: The inner ear reflexology hand point is located on the back of your hand in the webbing between the pinky finger and ring finger. It’s a small circle at the base of the fingers where they meet the hand. How to massage: To massage this point, use the knuckle of your index finger on the opposite hand to press and twist on the point. You can do this for about 8 to 10 twists. When you have a headache, it’s very likely that this point will be sensitive. Use enough pressure that you feel the point, but not so much that it’s extremely painful. You just finished massaging the points on your left hand. Go back to point number one, and repeat for your right hand. You can practice this hand reads like salty routine for a headache couple times per hour to help keep the pain at bay. If you do get the opportunity to rub your feet, I would recommend practicing the 4 points on your feet for headache and migraine pain relief. 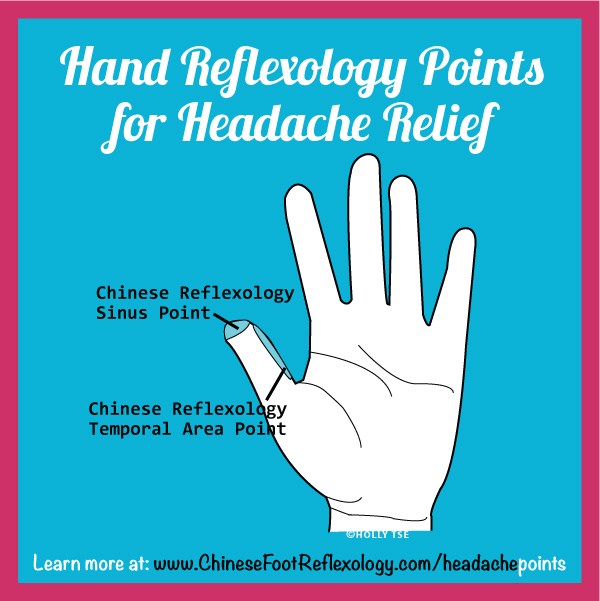 The foot points are much more powerful at relieving headache pain, but these hand points sure come in handy! A Handy Freebie for You! Want more hand points? 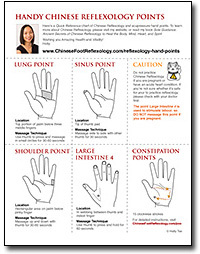 Get a free downloadable Quick Reference chart with hand reflexology points for colds, shoulder pain, constipation, and more. Simply fill out the form to get your free hand chart and a free Chinese Reflexology foot chart too. As a new subscriber to my monthly newsletter, you’ll also receive complimentary mini lessons on Chinese Reflexology. It’s a fun way to learn self-healing tips and techniques for the body, mind, heart, and spirit.